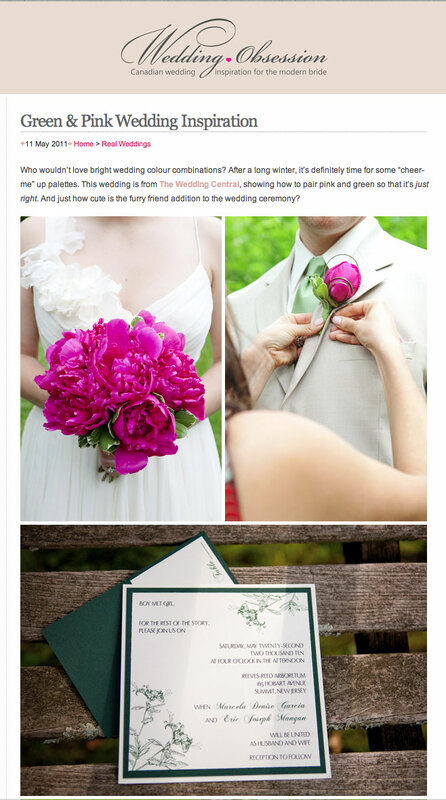 I’m beyond thrilled to see Marcela and Eric’s spring wedding featured again. This time, the beautiful Canadian Wedding Blog, Wedding Obsession published their lovely wedding. Marcela and Eric had a beautiful wedding at the Reeves-Reed Summit Arboretum in New Jersey. Their spring wedding was filled with colors that featured hot pink peonies and dark greens of the stationary and orquids; this colorful palette blended so well with the gorgeous gardens.